Click on the map to see photographs arranged by Relocation Camp. In February, 1942, three months after Pearl Harbor, the United States took unprecedented action directed at its own population. Executive Order 9066 and Civilian Exclusion Order 5 decreed that over 120,000 Japanese Americans be removed from their homes in the "western defense zone" of the United States, and incarcerated in ten "internment" camps, which were located in isolated areas of Utah, Montana, Arkansas, Arizona, California, Colorado, and Idaho. These ten camps functioned as prison cities, with populations of 10,000 to 18,000 people in each camp. With the bombing of Pearl Harbor, the Japanese Americans in America were no longer seen by other Americans as industrious, immigrant neighbors but were transformed into enemy aliens overnight. There were no trials, no hearings to prove innocence or guilt. They were assumed to be the enemy and made prisoners, indefinitely incarcerated because of their race. Successful Japanese-Americans were informed that, according to Civilian Exclusion Order 5, they were required to liquidate all property, including homes, real estate, business holdings, and anything else that they could not carry themselves into the prison camps. They lost their homes, property, and communities. Families were separated. After the war there was a long silence because of their shame and guilt, not unlike the victims of the holocaust. The work "American concentration camps" is about a collective memory of the camps that "interned" 120,000 Japanese Americans during World War II without trial. Its memories are about the reconstruction of that time and space fifty years later. It is about transition of the immigrant Japanese American people caught between two countries at war; people caught without a country that would claim them as their own. It is about their collective voices and memories of that displacement, and it is about the quiet silence that surrounds the land, those prison cities, and that time. Almost fifty years later, Presidents Clinton and Reagan have issued letters of apology to the camp survivors that are still living. Collective voices now reach beneath the surface of the stereotypical Japanese American image of passive acceptance, "gamman" ("endurance"), "shikata ga nai" ("it cannot be helped"), and survival. Their voices call out beyond anger and memory. The French theorist Michel Foucault noted that nineteenth century prison architectural plans were often based on the panopticon, where one prison guard can see all of the prisoners in their separate cells. Such a space exudes hierarchy and control. These photographs of the concentration camps are about a mapping of space. 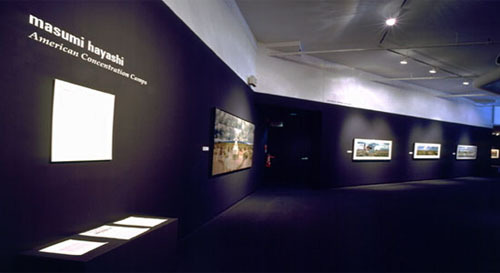 The viewer can instantly see a 360 degree panoramic view which would otherwise circle around her, thus the viewer becomes both prisoner and guard within the photograph's memory. The camera's eye records a panoptic space, an impossible two-dimensional space composed of overlapping cubist images. From over 100 images, sequential fragments make up one panoramic photo collage, extended and stretched like a warped shoji screen. They present the gestalt of looking at many fractured images and seeing a unified whole. These photographs confront the viewer with the beauty of the natural landscape and ironically with the history and memory of the land.